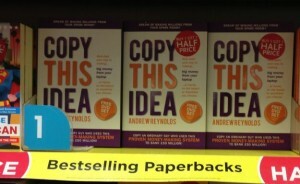 Andrew Reynolds brand new book, Copy This Idea, has just been launched and has already entered the WH Smiths Non-Fiction Chart and their Business Books Chart, at the NUMBER ONE position – in their travel outlets, such as major rail stations, motorways, major airports etc. 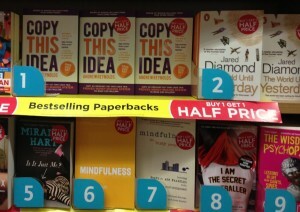 Last month the number one book in these charts was the biography of Steve Jobs. But Copy This Idea leapt straight into that number one slot when it was officially released. 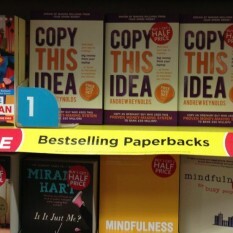 WH Smith are featuring the book in large prominent displays in key locations. These include Victoria Railways station, London City Airport and Heathrow. The book is very different to standard ‘business books’. It doesn’t contain any charts or graphs, nor any reference to forecasting etc. Instead Copy This Idea is a step by step introduction to Andrew Reynolds methods of making money working at home from your laptop, PC or tablet. The book provides a great kick start for anyone wanting to start in their spare room at home. Copy This Idea shows a simple to understand overview of the way that Andrew Reynolds uses to make money. It is a system that has so far seen him bank over £50Million. His journey started when he handed in his notice at work and set up in his little business. Copy This Idea is published by leading publisher John Wiley and Sons Ltd and is out this month in paperback at just £9.99. (Kindle version due for release soon). Copy This Idea includes a free set of DVDs that readers can use to learn more about how the business works, plus a certificate entitling the reader to a one to one email consultation with the author. You can grab a copy of the book at any WH Smiths travel location or by clicking here. You can copy the business strategies from Andrew Reynolds, to start your own business, but its also about doing something useful with that money, once you’ve secured your own financial position and helped your family and those close to you. It’s about having a vision of what you would like to do with the money you make. “Always keep in mind that I started probably in the same position as you. I had no customers, no products, no business – and I had no idea what I was doing. I simply copied a successful business idea – tweaked it and applied it in my own way. © All content copyright 2019 Andrew Reynolds. All rights reserved. The terms Andrew Reynolds, Cash On Demand and Copy This Idea are trademarks of Andrew Reynolds.